Breaking News: New Zealand is the best country in the world! In April this year, New Zealand took out the Telegraph newspaper's top travel award. Over 75, 000 of the Telegraph's readers in the United Kingdom voted for their favourite travel products, from destinations to airlines, and named New Zealand as the 'Best Country in the World'. This is not news to me, as a proud kiwi. It's not news to any of us at VroomVroomVroom, as we have been helping travellers seek out the very best of New Zealand from the comfort of a rental car for years now. This is the fourth year in a row that New Zealand has taken out this honour. It is always nice to receive compliments, and what was interesting were the reasons so many visitors rate little old Aotearoa/New Zealand as the ultimate travel destination. Many of the 26 reasons cited were around landscapes. Let's face it, there are loads of beautiful places in the world. What makes New Zealand unique is the variety of stunning scenery, with completely different aspects closely accessible. 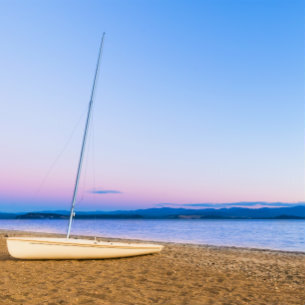 Take Taupo, where New Zealand's largest lake sits on a volcanic plateau, surrounded by mountains. Sailing and skiing are possible on the same day, with a 90 minute drive in between!Head west to New Plymouth. You have a brooding movie star mountain, Mt Taranaki, with a goblin forest at its base, but you could be surfing at a wild black sand West Coast beach with less than an hour's drive. Of course, then there's no end of movie ready locations throughout the South Island. You can get a load of plenty of them just by flying into Queenstown Airport. Or fly into Christchurch, with an eyeful of the Southern Alps, then take the Tranz Alpine train to Greymouth. That will open up the West Coast, where rain-forests meet dramatic seascapes and mountain vistas. Walking the world's greatest hike, the Milford Track, was high on the list. While Milford has a high profile, did you know there is not one, but nine similar walks as part of the 'Great Walks Network'? There are six in the South Island, and three in the North Island. One of them, the Heaphy Track, accessible from Nelson is also open to mountain bikes over winter. Cycling tourism is the current buzz, with the nearly completed nationwide cycle path Nga Haerenga in full swing. Nelson and Rotorua are the only locations outside of the United States to have Gold ride status, conferred by the International Mountain Bicycling Association (IMBA). 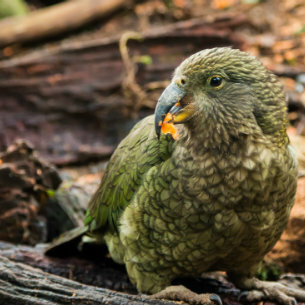 New Zealand's native parrot, the Kakapo was reason number 5. This bird went viral after trying to mate with a zoologist's head when filming a nature documentary. Now, while the Kakapo is the world's largest parrot, it is also critically endangered, with around 150 birds left in the wild. So your chance of getting to see one is pretty slim. The good news is, that New Zealand has loads of unique native birds. Back in prehistoric days, as New Zealand had no native mammals, the whole food chain existed through bird species. Sadly, many of those varieties are now extinct; it would be pretty cool to still be able to see a giant 3.6 metre moa crashing around in the bush. There are some incredible places where conservation efforts are recreating the bush as it was 80 million years ago. In Wellington, there's Zealandia which is a 225-hectare sanctuary valley, created with a unique predator-proof fence. Here you can see some of New Zealand's rarest birds: such as the Hihi, Saddleback and Takahe. You can also see New Zealand's living fossil, the Tuatara, from the time of the dinosaurs. If you take a night tour, you have the chance of finding a little spotted kiwi. Just out of Auckland, a short ferry ride can take you to Tiritiri Matangi, an island sanctuary. Finally, culture featured on the list of reasons New Zealand is the greatest country in the world, as the home of the Haka, and the uniqueness of Tikanga Maori. The best thing about Maori culture is that it is a living, breathing, adapting force that remains an essential fabric in New Zealand society, not just something turned on for tourists or rolled out as a rugby test warm up. There are lots of ways to get involved. The most obvious is to attend any one of the cultural shows on offer in Rotorua. 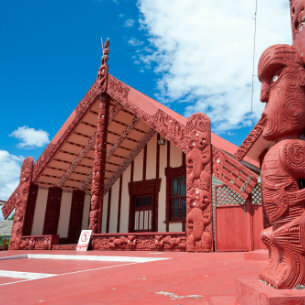 The city is recognised as the cultural centre of Maoridom, where one third of the population is of Maori descent. There are four different options, and each has its own point of difference. My favourite is at Te Puia Village in the Whakarewarewa Thermal Valley, also home to the New Zealand Maori Arts and Crafts Institute. You don't have to get your Maori cultural experience in a package, genuine chances for connection exists in every day exchanges. Totally Tarawara offers water taxi services on Lake Tarawera, guiding, and glamping at Te Rata Bay. Co-owner Karen Walmsley just happens to be descended from famous guide Sophia Hinerangi of the Pink and White Terraces in the 19th century, and enjoys sharing the stories of her ancestral lands. Back in the big smoke of Auckland, take an award winning day tour with a Maori perspective with Time Unlimited Tours. Whew! So much to see and do. The absolute best way to take it all in is with the convenience of a hire car. At VroomVroomVroom, not only do we have the best cars at the best price, but we have all the advice you need on places to go and things to see. Don't wait! Let's see you soon!